Responding to stress: We have all at some point taken comfort in “retail therapy.” Overspending occurs when this becomes our go-to method for coping with feelings of emptiness, anxiety, guilt, shame, or depression. This stress response is nearly always a short term fix with diminishing returns. Symptoms resemble addiction: Compulsive overspending shares traits of Substance Use Disorders, namely in developing tolerance where more spending is required to get the same level of stress relief, and experiencing withdrawal resulting in restlessness, irritability, and preoccupation when unable to spend. The urges to spend may seem as uncontrollable and insatiable as any drug craving. Budget busting: If overspending is impacting personal finances to the point that bills are going unpaid, credit cards are maxed out, payday loans are procured, or fraud is committed, it is a significant problem. Negatively impacts relationships: As a result of a busted budget, you may feel compelled to lie about your finances to a romantic partner, family, friends, or colleagues. Lying about spending will almost certainly damage these relationships. Severe buyer’s remorse: The spending spree provides instant gratification, but ultimately leaves you feeling empty and dissatisfied, even feeling guilt and shame over the money spent. 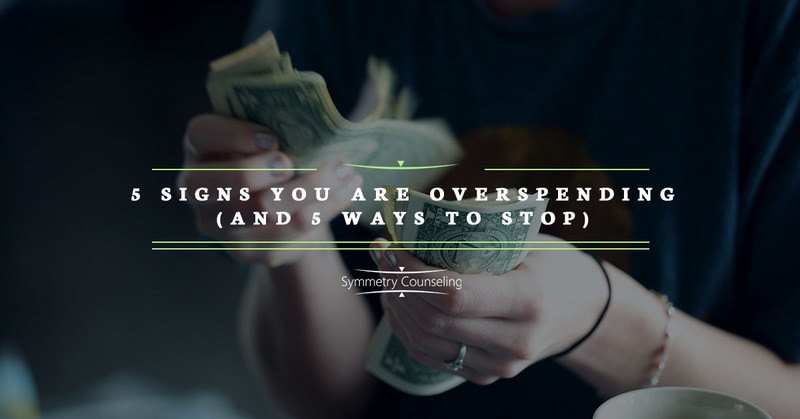 This can perpetuate this cycle of overspending as a maladaptive coping mechanism for avoiding negative emotions. Prepare yourself for change: Start by building your motivation to make changes in your spending. See my previous blogs about the Stages of Change and using a Cost Benefit Analysis to put yourself in the best possible position to succeed. Using these motivation building tools will help you make lasting changes. Examine your spending habits: Take a long, hard, and brutally honest look at your spending habits. This probably will not look pretty or likely feel good, but it will show you the reality of your spending. Utilize a budgeting app like Mint to categorize spending and gain understanding of your habits. Impede your spending abilities: Set up obstacles to make it more difficult to overspend. Cut up credit cards, delete saved payment information from websites and browsers, and work with your bank to limit spending. These steps grant opportunities to rethink giving into the urge to spend. Get help and support: Your chances of success increase with peer support. Debtors Anonymous is a 12-Step Fellowship that has existed since 1968 and hosts several Chicago area meetings. While SMART Recovery does not specifically address overspending, its broad evidenced-based approach can be applied to changing thoughts and behaviors to stop overspending. Seeking professional help for overspending is also highly recommended. At Symmetry Counseling Chicago, we have therapists who specialize in behavioral and financial therapies. Contact us today if you need help with your overspending!